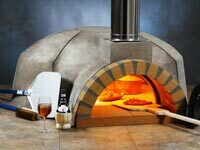 Retained heat cooking uses heat retained in your oven dome and floor to bake and roast at lower, more traditional temperatures. 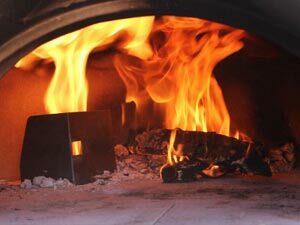 When cooking in a wood-fired oven, bring your oven to full heat (750°F — it should take about an hour or less,) then let your fire die out and rake out your coals. 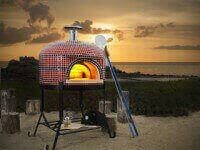 Close your brick oven door to hold in the heat, and to let your pizza oven settle and regulate. 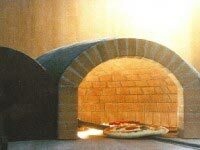 If you want to bake or roast for longer periods of time, you should fire your brick oven longer. 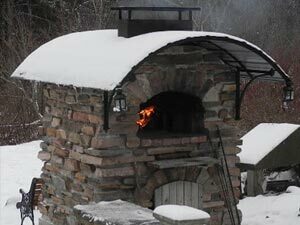 Remember, your pizza oven is a “reservoir” of heat, where the thermal mass of your wood fired oven absorbs the heat of the fire and allows retained heat cooking. 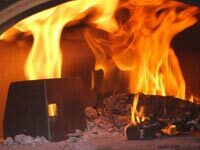 The more heat you put in, the more you can take out. 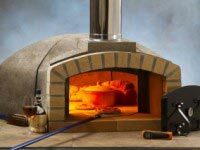 Baking and roasting (and heat loss through the open door) take heat of out your brick oven, so if you want to roast a large meal or bake lots of bread, you have to first “put” enough heat in your pizza oven with a longer firing. 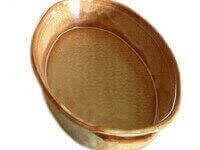 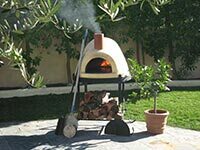 Conversely, if you only want to roast a chicken, or bake a couple of loaves of bread or focaccia, you can cut back on your firing time. 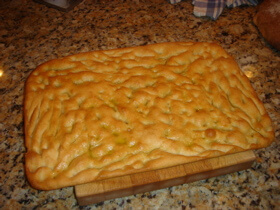 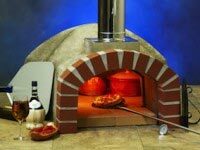 Just bring your brick oven up to heat (30-45 minutes), and quickly let the temperature settle. 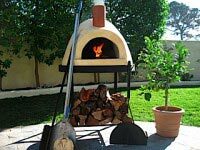 You will burn less wood, and your wood fired oven will be ready sooner — though it will give up its heat more quickly and not cook as long (there’s nothing worse than pink chicken). 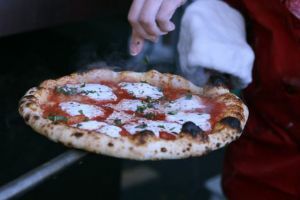 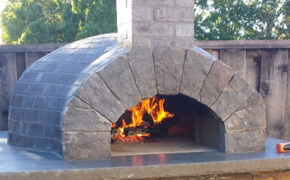 About an hour after reaching full heat, your pizza oven temperature will fall to roughly 550°F, where you can cook a wide range of dishes using the oven’s retained heat. 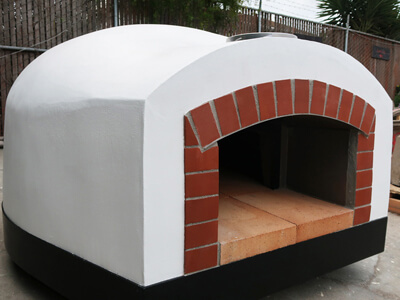 Your oven will then take hours to gracefully fall from 550°F to 300°F, giving you time to bake multiple batches of bread, roast a turkey, or bake wonderful casseroles, gratin dishes, rice, beans, soups, stews, and roast potatoes. 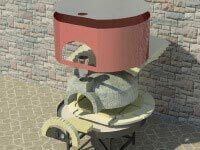 In Medieval times, the heat in a communal brick oven was valuable, and the locals would have to pay the Lord for use of a hot oven. 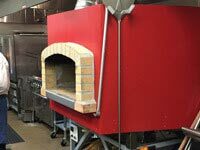 In many rural communities to this day, bakeries throw open their wood fired ovens so that locals can bake their bread, or their Paella, using retained heat. 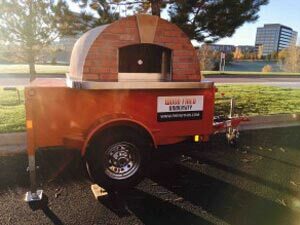 Today communities around the country are hosting Pizza Parties and “Bring Your Own Baking”-style potlucks as a way to build friendships and strengthen neighborhoods. 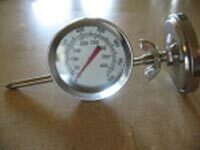 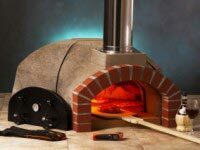 You can also buy an Infrared Thermometer to more accurately monitor the oven temperature. 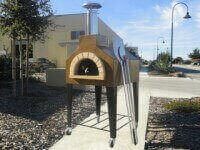 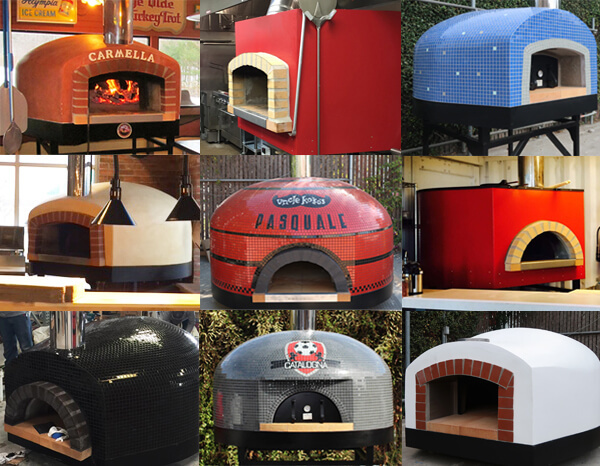 Enjoy your pizza oven and all of the various and wonderful food it can bake! 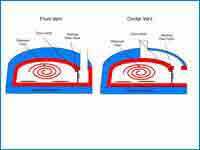 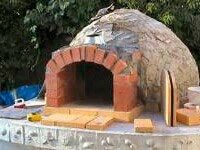 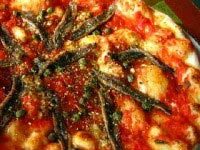 Check out these related articles about Brick Oven Cooking Techniques. 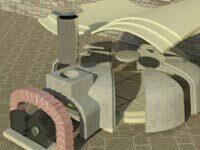 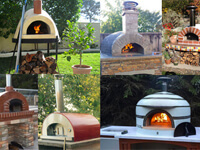 Return to Brick Oven Cooking overview page and experience the joys of wood fired cooking. 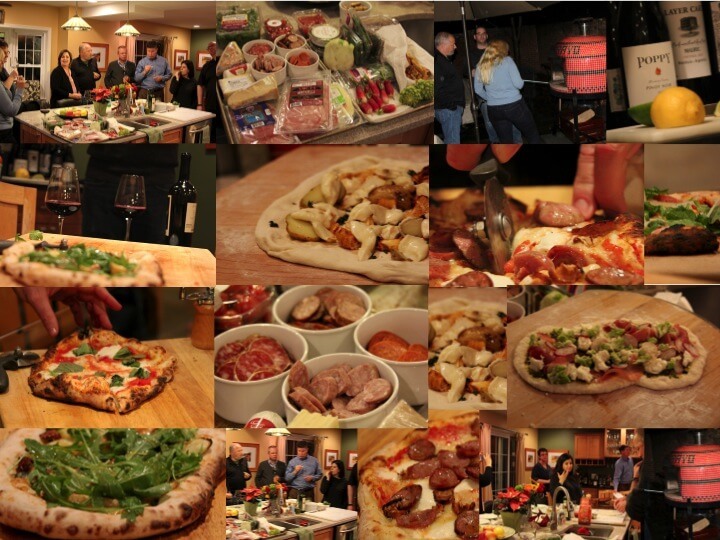 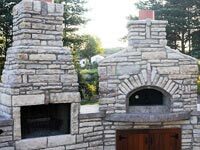 Over 200 brick oven cooking recipes including grilling from professional chefs and guests. 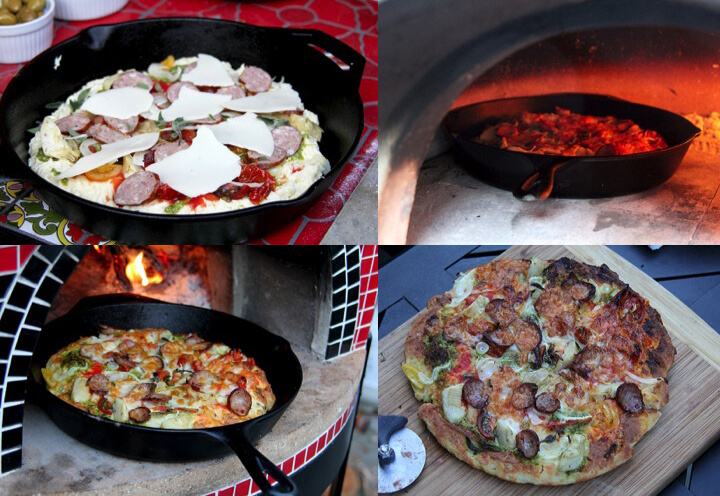 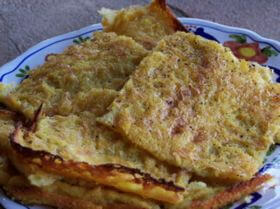 Our cookbook has both videos and printable recipes for you to try. 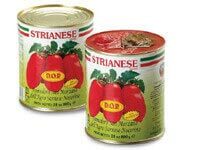 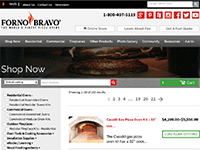 Try a new cooking style. 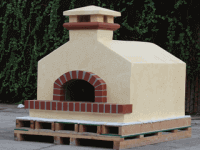 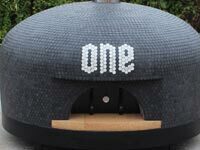 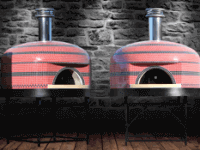 Forno Bravo brick ovens can be used for roasting, baking bread or pizza, and grilling. 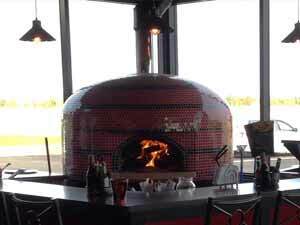 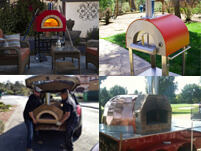 Forno Bravo brick ovens are for more than pizza! 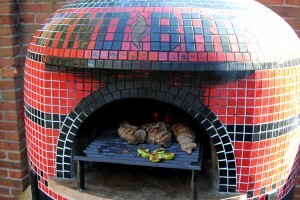 Learn about grilling techniques here. 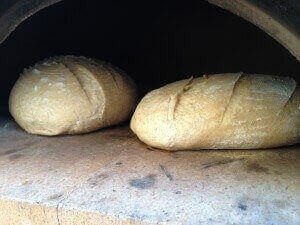 Creating steam in a regular oven or a brick oven is what separates just a boring loaf of white bread shaped into a skinny oval from a real baguette. 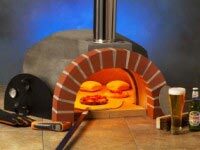 Should you use a wooden pizza peel to build your pizza on and then set it in your oven, or should you make it on a flat surface, and use a metal peel to place it in your oven? 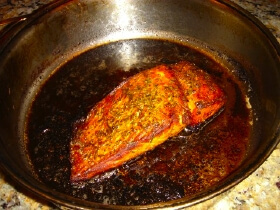 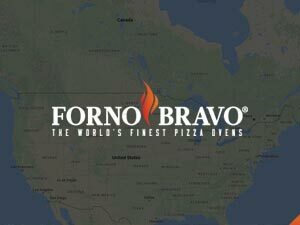 Ready to get a Forno Bravo? 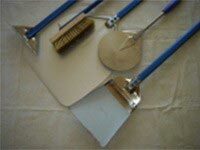 If you have seen enough and are ready to buy, these links will help. 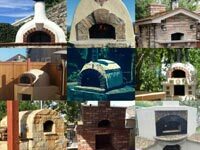 The Forno Bravo Selection Wizard is designed to help you decide which pizza oven is right for your house, garden, or restaurant. 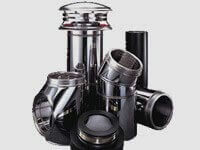 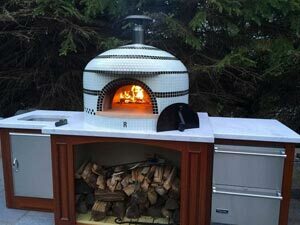 The Selection Wizard will walk you through the selection process, with questions covering such topics as — who will be doing the installation, available space, the types of foods you will be cooking, how many you feed, and your budget considerations. 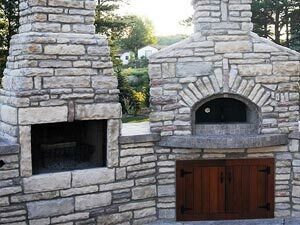 Whether you are looking for a do-it-yourself brick oven, or a modular pizza oven kit for your outdoor kitchen, we have a wood or gas fired pizza oven for your family. 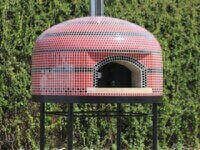 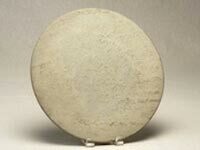 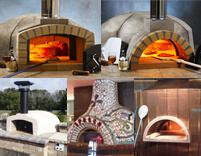 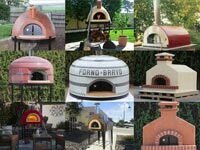 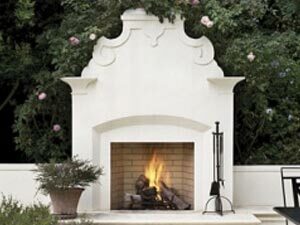 Forno Bravo offers the most diverse refractory, stainless steel, and brick oven products available in the market. 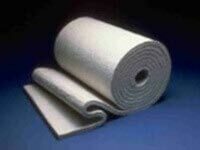 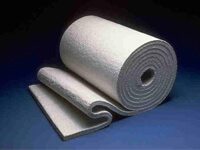 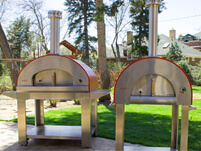 Made in the USA in our facilities in Colorado and California. 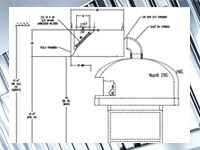 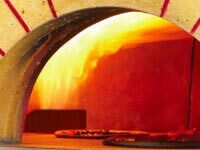 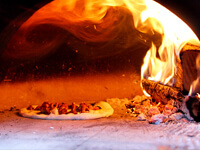 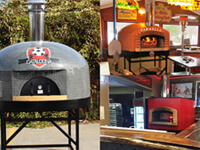 Pizza ovens can be the center of your restaurant or a supplement to your menu plans. 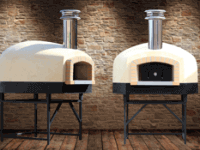 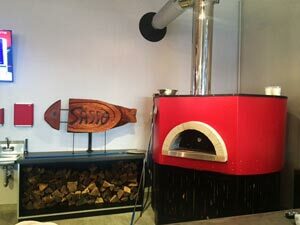 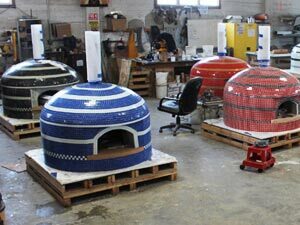 Forno Bravo commercial pizza ovens come in a variety of sizes, assembled styles, or kits/knock-down models to accommodate your space and vision. 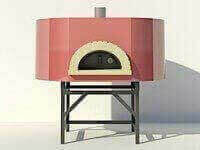 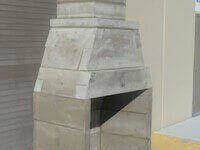 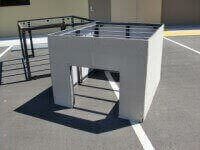 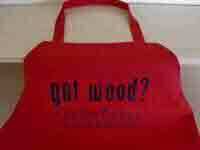 They can be custom branded to match your company’s look and have both wood or gas fired options. 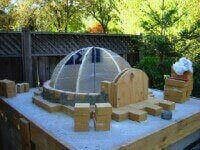 UL certified in the US and Canada for indoor and outdoor installation. 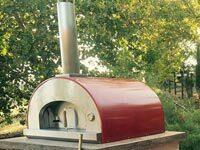 With the widest selection of home and commercial pizza ovens on the market, you can purchase online or contact us directly.